Following these instructions, correctly or incorrectly, may leave you with a completely broken or bricked device. Furthermore, flashing your device may void your warranty - Samsung uses eFuses to permanently flag occurrences of a device running non-Samsung software, such as TWRP. I take no responsibility for what may come of using these instructions. Wait for Heimdall to output "RECOVERY upload successful"
Any Linux, Windows or macOS program capable of fully backing up a USB storage device should be usable from this point. The procedure below uses the dd command on Linux. dd will take a long time to complete, depending on the size of your device, USB connection speed, etc. With the image now obtained, you could mount it on your desktop, or restore it to the device at a later date. I'll hopefully get around to writing separate posts for both in future. Ceph now requires C++17 support, which is available with modern compilers such as gcc-7. openSUSE Leap 42.3, my current OS of choice, includes gcc-7. However, it's not used by default. While working on a Ceph OSD multipath issue, I came across a helpful post from Dan Horák on how to simulate a multipath device under QEMU. This attaches two virtual SCSI devices to the VM, both of which are backed by the same file and share the same SCSI logical unit identifier. [  190.926597] device-mapper: multipath: Failing path 8:0. The above procedure demonstrates cable-pull simulation while the broken path is used by the mounted dm-0 device. The subsequent I/O failure triggers multipath failover to the remaining good path. I've added this functionality to Rapido (pull-request) so that multipath failover can be performed in a couple of minutes directly from kernel source. I encourage you to give it a try for yourself! I presented a short talk at the 2017 openSUSE Conference on Linux kernel testing using Rapido. There were many other interesting talks during the conference, all of which can be viewed on the oSC 2017 media site. A video of my presentation is embedded below. Many thanks to the organisers and sponsors for putting on a great event. This week's "Git Rocks!" moment came while I was investigating how I could automatically add Reviewed-by, Acked-by, Tested-by, etc. tags to a given commit message. Git's interpret-trailers command is capable of testing for and manipulating arbitrary Key: Value tags in commit messages. The above examples work by replacing the normal git commit editor with a call to git interpret-trailers, which appends the desired tag to the commit message and then exits. As an example, the following will see three commits applied, with the commit message for two of them (d9e994e and 5f8c115) appended with my Reviewed-by tag. Bonus: By default, the vim editor includes git rebase --interactive syntax highlighting and key-bindings - if you press K while hovering over a commit hash (e.g. d9e994e from above), vim will call git show <commit-hash>, making reviewing and tagging even faster! 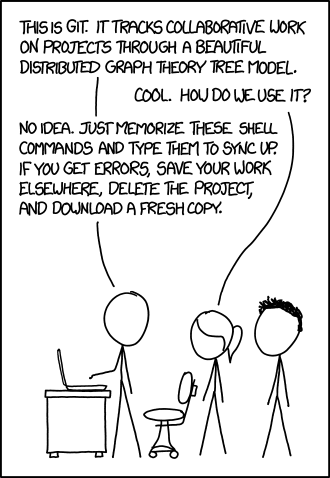 Upstream Git developers, especially those who implemented the interpret-trailers functionality. I've blogged a few of times about how Dracut and QEMU can be combined to greatly improve Linux kernel dev/test turnaround. My first post covered the basics of building the kernel, running dracut, and booting the resultant image with qemu-kvm. A later post took a closer look at network configuration, and focused on bridging VMs with the hypervisor. Finally, my third post looked at how this technique could be combined with Ceph, to provide a similarly efficient workflow for Ceph development. In bringing this series to a conclusion, I'd like to introduce the newly released Rapido project. Rapido combines all of the procedures and techniques described in the articles above into a handful of scripts, which can be used to test specific Linux kernel functionality, standalone or alongside other technologies such as Ceph. The following procedure was tested on openSUSE Leap 42.3 and SLES 12SP3, but should work fine on many other Linux distributions. Install Rapido dependencies: dracut and qemu. In a whopping four seconds, or thereabouts, the VM should have booted to a rapido:/# bash prompt. Leaving you with two zram backed Btrfs filesystems mounted at /mnt/test and /mnt/scratch. Everything, including the VM's root filesystem, is in memory, so any changes will not persist across reboot. Use the rapido.conf QEMU_EXTRA_ARGS parameter if you wish to add persistent storage to a VM. set MAC_ADDR1 to a valid MAC address, e.g. "b8:ac:24:45:c5:01"
set MAC_ADDR2 to a valid MAC address, e.g. "b8:ac:24:45:c5:02"
This usage guide builds on the previous standalone Linux VM procedure, but this time adds Ceph to the mix. If you're not interested in Ceph (how could you not be!) then feel free to skip to the next section. Step II - Start a vstart.sh Ceph "cluster"
Once Ceph has finished compiling, vstart.sh can be run with the following parameters to configure and locally start three OSDs, one monitor process, and one MDS. The cut_cephfs.sh script generates a VM image with the Ceph configuration and keyring from the vstart.sh cluster, as well as the CephFS kernel module. Dracut and QEMU can be combined for super-fast Linux kernel testing and development. Rapido is mostly just a glorified wrapper around these utilities, but does provide some useful tools for automated testing of specific Linux kernel functionality. If you run into any problems, or wish to provide any kind of feedback (always appreciated), please feel free to leave a message below, or raise a ticket in the Rapido issue tracker. Add cut_tcmu_rbd_loop.sh details and fix the example CEPH_SRC path. Developing a USB gadget application that runs on Linux? Following a recent Ceph USB gateway project, I was looking at ways to test a Linux USB device without the need to fiddle with cables, or deal with slow embedded board boot times. 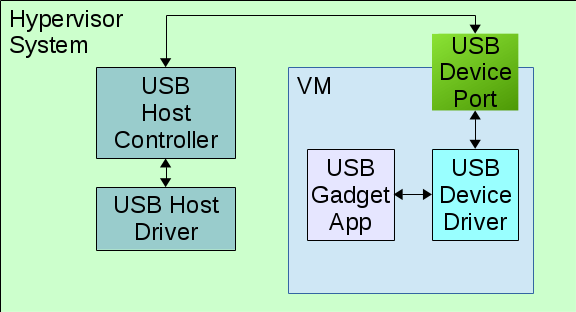 Ideally USB gadget testing could be performed by running the USB device code within a virtual machine, and attaching the VM's virtual USB device port to an emulated USB host controller on the hypervisor system. I was unfortunately unable to find support for virtual USB device ports in QEMU, so I abandoned the above architecture, and discovered dummy_hcd.ko instead. 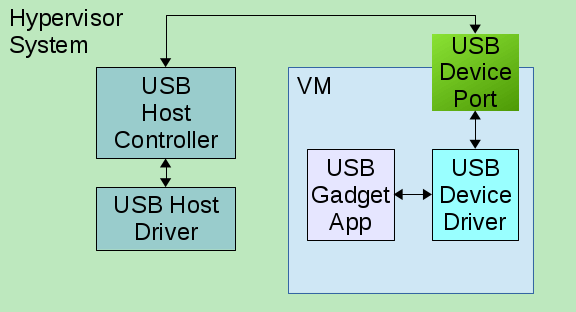 The dummy_hcd Linux kernel module is an excellent utility for USB device testing from within a standalone system or VM. It can be enabled via the USB_DUMMY_HCD kernel config parameter. Once the module is loaded, no further configuration is required.